The highly competitive nature of automobile industry has pushed the automobile companies to take up innovative marketing strategies involving costly, cost effective and value effective promotional tools. 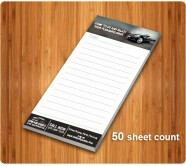 Custom automobile notepads are the hottest cost effective promotional tools which are in demand since a few years back. Lots of hi-tech promotional gifts have been introduced during campaigns by the advertisers over the years to lure their clients but nothing seems to work effectively as personalized automobile notepads. These scribbling pads offer brilliant capitalization canvas for automobile advertisers to work upon and valuable utilization space for clients to work upon. Auto dealers, automobile manufacturers, automobile services are some of the services, who can benefit from giving away promotional automobile notepads during trade expos, automobile introduction events and other outdoor promotions. A user who grabs these personalized auto notepads to scribble their daily information will see your brand and will think only about you when they decide to invest in a vehicle or wish to get their vehicle serviced.